In one week we went to three live performances. All my readers in the big cities could go to one every night and not repeat themselves so why do I find this so incredible? It is quite simple I am spending much of my time in Santa Fe, New Mexico where the population is 68,000 while that of Manhattan, where my gallery is, has over 1 ½ million people living there. New Mexico is one of the poorer states in the country but the prices are lower too. Top price for a solo performance by Patti Lupone is $92, we skipped that because we can do Broadway in New York. The show we went to “Marx in Soho” cost us $8 for two. Not the best seats in the house, it was sold out, but the back of the Orchestra is not bad. “Marx in Soho” is by Howard Zinn and the solo performance is by Brian Jones who took this show on the road at the end of the 1990’s and between gigs teaches 4th grade. 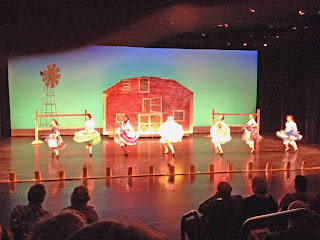 From the performance we saw we wanted to be in that classroom because you could tell what a great teacher he must be. 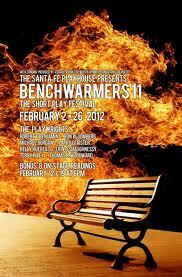 The next evening we went to “Benchwarmers 11,” an annual event that consists of 8 short plays written around the center piece, a bench; sometimes appearing in a park, sometimes in the country side and sometimes on the street. Of the eight that we saw we thought that five were quite good, not a bad average for locally written and directed plays! 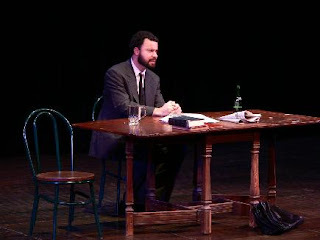 It was particularly enjoyable because we knew one of the playwrights. It was her debut in the craft and the play was hilarious. Our last theater experience for the week was at the National Dance Institute’s (NDI) Dance Barns, for their “Winter Escape” performance. I have written about this program for kids before. The program ranged from ballet to contemporary dance to show music (the latter both danced and sung). NDI shows always give me a little lift. One piece from the younger group (10-year-olds) was so good that I would like to find an additional venue for it, but it is too early to discuss here. Since then my wife went to a standing room only history lecture and we went together to a lecture by a young computer scientist and poet , Brian Christian, had written a book called, “The Most Human Human: What talking with computers teaches us about what it means to be alive,” and that was what his lecture was about. Now to make that interesting and amusing as a lecture takes real talent! We will soon be listening to a moderated panel on film in New Mexico. We are all acquainted with the many Westerns that were filmed in this state but there are many others as well. We also have three Cinematheques here, small theaters that show independent, avant-garde or classic films and our opera is known internationally. Why all the culture in this relatively small town? 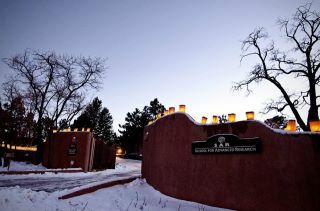 There are many reasons but here are a few: German Jewish Merchants including names like Seligman, Florscheim, Wertheim and Zeckendorf, emigrated here in the 19th century; we have had an artists’ colony since New Mexico became a State in 1912; the School for American Research founded here over100 years ago made it possible to develop the study of Southwestern archeology. Today known as The School for Advanced Research it hosts archeologists, anthropologists, ethnologists and artists on a bucolic campus to pursue their own studies and exchange ideas. Best known of all in the region is the Los Alamos Lab (birthplace of the atomic bomb) which has brought many scientists to the region. From this was born the Santa Fe Institute, a think tank created in 1984 which attracts not only scientists but college professors and researchers to study complex systems. They sponsored the lecture by Brian Christian mentioned above. Bringing all these people together has attracted an older more socially active and intellectual community to create this great culture center of the Southwest. Thank you, i am glad you liked it. Every time i leave town i miss something that i wanted to do. At least the exhibitions stay up longer here but the lectures disappear just as quickly as anywhere else! This is fantastic! We have so much art in Santa Fe and it's great to see your highlights on the performances. I've shared a link to your post on my blog because I'm sure my readers will enjoy your missive as much as I did. Thank you for your kind comments. I appreciate your making me aware of your blog as well.